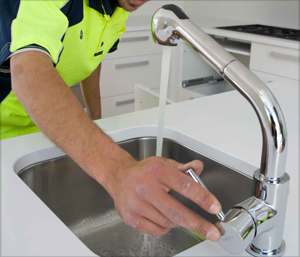 Laser Plumbing Christchurch East provides a wide range of plumbing services for around the home, serving all of Christchurch's suburbs and surrounding areas. Our highly qualified and experienced plumbers can provide you with all the services you would expect from a reliable plumbing contractor. From leaky taps through to complete bathroom and kitchen renovations, our team of qualified plumbers have the experience to quickly and effectively handle all your domestic plumbing requirements. No job is too big or too small! Any plumbing upgrade, installation, service or repair that you need, you can count on Laser Plumbing Christchurch East to help. Through innovation, planning and use of quality systems we take pride in providing you with the highest level of customer service. We ensure consistent national pricing, professional tradesmen and high quality workmanship. Need a plumber that’s Totally Dependable? Please contact Laser Plumbing Christchurch East to discuss your requirements.